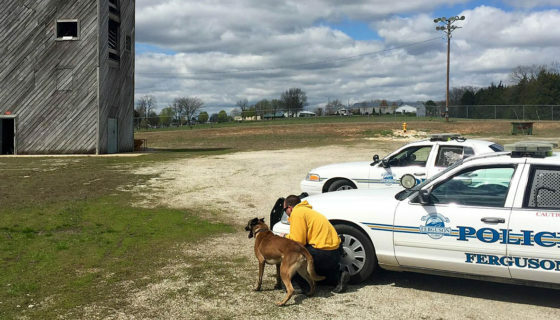 Over the last several articles, we have discussed what capabilities a dog possesses and how those capabilities can be integrated into tactical teams. One topic that may be of interest to you that I have not yet given any time to is that of the actual equipment used by dogs in this sort of tactical application. When determining the equipment requirements for any mission, you must first understand the nature and characteristics of the mission. A series of mission parameters must be determined. How long is this mission going to take if everything goes according to plan? What if everything goes to hell in a hand basket? What level of risk are you willing to accept? How are you getting onto your objective? Parachuting in? Water insertion? Fast rope on a helicopter? Walking in? How are you getting out? How far are you going to have to travel, and over what terrain? Mountains? Ice and Snow? Urban? Rural? Now that we know the parameters of the mission we can begin to determine the equipment requirements. First, determine what the operators will be carrying and using, and then you can largely mirror that equipment for the dog. A few additional things to consider is that there are times when you’ll want your dog to do things slick. This means without any equipment on at all. During these times, what are you going to do with your dog’s equipment? If the answer is that the handler is going to have to carry it, then this should influence your decision on what equipment to take with you. In addition to this, whenever possible, the dog should carry all of his own equipment. The most basic equipment that should always be carried for and on a dog are a flat collar, a prong collar (mission dependant), two six foot leads, a 15 foot tracking line and a 30 foot tracking line. For more information on this, see part one and part two of my basic equipment videos. There are multiple harnesses that can be used for the tactical K-9. 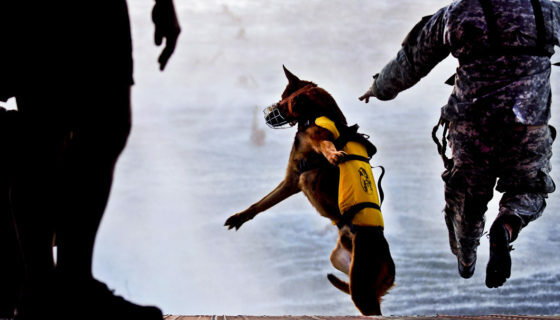 You have tracking harnesses that may be used for specific applications, lifting and lowering harnesses that may be used under certain circumstances or specially designed airborne harnesses used to attach a dog to his handler during parachute jumps. There are also rappelling harnesses used to sling a dog on your back for use during rappelling, fast roping and ship boarding. You may even choose to use load-bearing harnesses with packs or pockets attached so that your K-9 carries his own equipment, specifically food and water during longer duration missions. These should be of a quick release nature so that the dog can be quickly employed if contact is made unexpectedly. 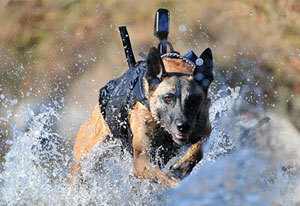 If the operators are all wearing body armor, then it may be a good idea for the K-9 to do so as well. This determination will have to be made based on the expected role the dog will play, as you don’t want things that can get hung up if you are deploying a dog through very tight spaces. However, if a dog is being used on an entry team to make contact with hostiles, then a vest may be advisable. Thankfully, there are quite a few configurations available now, but I would suggest using equipment comparable to what your operators are using. This equipment will vary based on your mission, but could include things like boots, used primarily for quieting the dog’s footsteps during movement on concrete or hard surfaces; goggles to protect their eyes if deploying through windows or where there may be significant flying debris (these are also highly recommended if training with Simunitions or paintballs); flotation devices if working in or around water; neoprene impact protection vests; or first aid kits specific to dogs. You will want you dog to have communications with the handler at all times. The best way to ensure this is to equip the team with a radio and frequency specific to the dog. 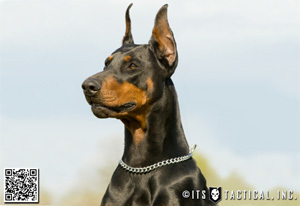 The primary and secondary handlers should be the only ones giving commands to the dog. While every team member should be able to handle the dog if both handlers go down, it can become very confusing if the dog is getting commands from multiple people. Maintaining solid and constant communications with the dog is critical for successful mission completion. And you don’t want to forget all of the high speed, low drag techno-gear that we discussed in the article on UGVs. This equipment can give the tactical team a significant advantage during the mission, but you need the dog to carry it into position for you. Joel is the founder and head trainer of Dunetos K-9, a training facility and equipment manufacturer specializing in Tactical and standard K-9 equipment. He has been training and handling dogs for over 10 years and works closely with Baden K-9, a highly respected training facility in Ontario, Canada. Joel has served in the United States Army for 11 years as a Military Police Officer deploying to the Pentagon days after the 9/11 attack, Afghanistan (2003), Iraq (2007) and is currently serving in Bogota, Colombia (2011) in the War on Drugs. Joel has specialized in integrating dogs into every aspect of life, from personal obedience and protection to specialized military application. << Dogs of War: Did You Hear Something? 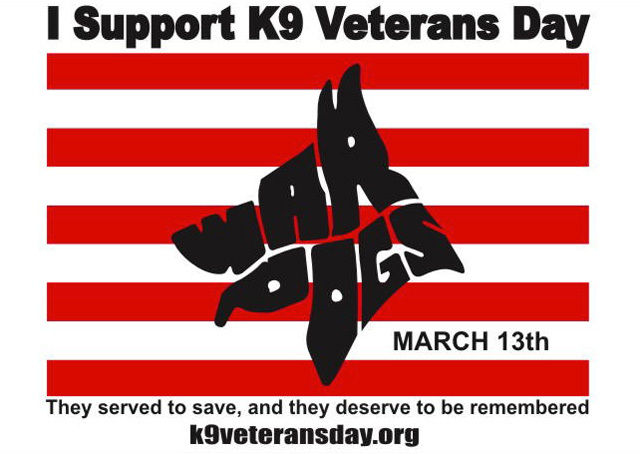 Today is K9 Veterans Day, Please Support our Working Dogs!